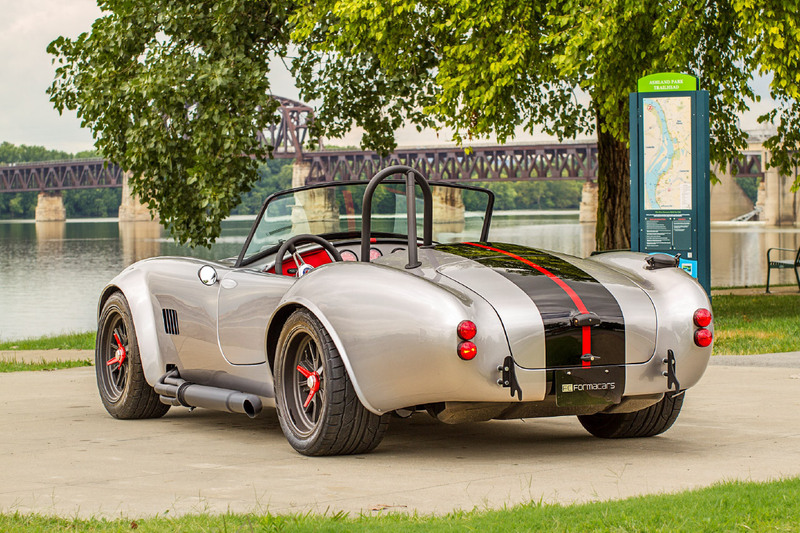 Each year, the Ohio Cobra Club, a 501(3)(c) non-profit organization, raffles off a Cobra replica with the net proceeds donated to the Cystic Fibrosis Foundation. The 2019 raffle car is a Factory Five Racing Mk4 Cobra replica that was designed using race proven engineering. 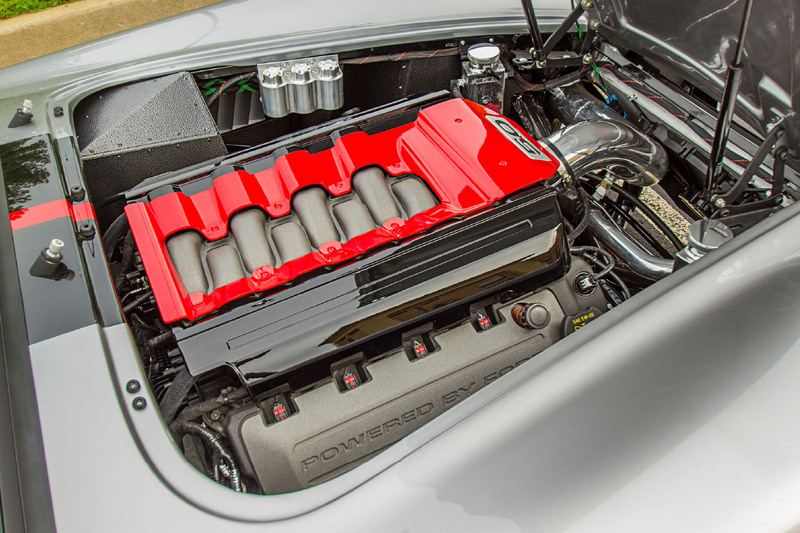 It was build using modern materials and takes advantage of the latest automotive technologies, such as a Ford Mustang V8 Coyote engine with selectable drive modes that cover a broad range of road conditions. All packaged in an authentic design that accurately reproduces the looks of the 1960’s era Shelby 427 Cobra. It is with great pleasure to say that over the years $1,333,000 has been donated to research to fight cystic fibrosis. We would like to thank everyone that makes a donation or purchases raffle tickets for helping support research that is working to find a cure for cystic fibrosis! Please visit the Cystic Fibrosis Foundation website, for additional information about CF. 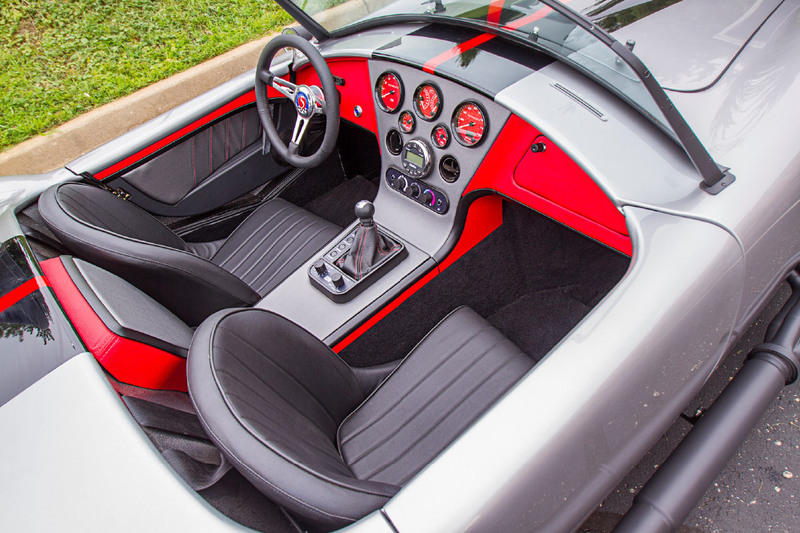 Your purchase of a chance to win this Cobra is a WIN / WIN, either you win this beautiful automobile or your ticket purchase will go to helping those with cystic fibrosis. Internet sales of raffle tickets will close at 5:00 pm EDT on Friday, June 21, 2019. About the Car - Priceless driving enjoyment! To learn more about this beautiful 2019 London Cobra Show's raffle car, click on the icons below. The chassis is fabricated from A513 1010 and 1020 DOM (drawn over mandrel) carbon steel tubing and A36 carbon steel plate. The 4” round frame rails are fabricated from 0.120” wall DOM steel tubing for strength. A rectangular steel dash/cowl hoop and an integral structural backbone section through the cockpit along with the round tube front x-member provide additional strength and greatly increased torsional rigidity. All chassis parts and triangulation bracing are placed in a jig and welded for accuracy. Steel side impact bars, door steel, footbox and cockpit dash hoop surrounds and front and rear energy absorbing crumple zones are added for additional occupant safety. The aluminum chassis panels in the engine bay, cockpit floor, transmission tunnel, fire wall, front inner wheel wells and luggage compartment are fabricated from precision laser cut 6061-T6 aluminum. All aluminum chassis panels are bonded and riveted to the chassis’ supporting matrix of steel tubing. Steel chassis is black powder coated for corrosion resistance while aluminum panels are Silver Artery powder coated. The composite body is a high quality, period correct, one-piece, 3/16” thick vinyl ester resin and fiberglass reinforced plastic molding engineered to complement the strong steel and aluminum chassis. 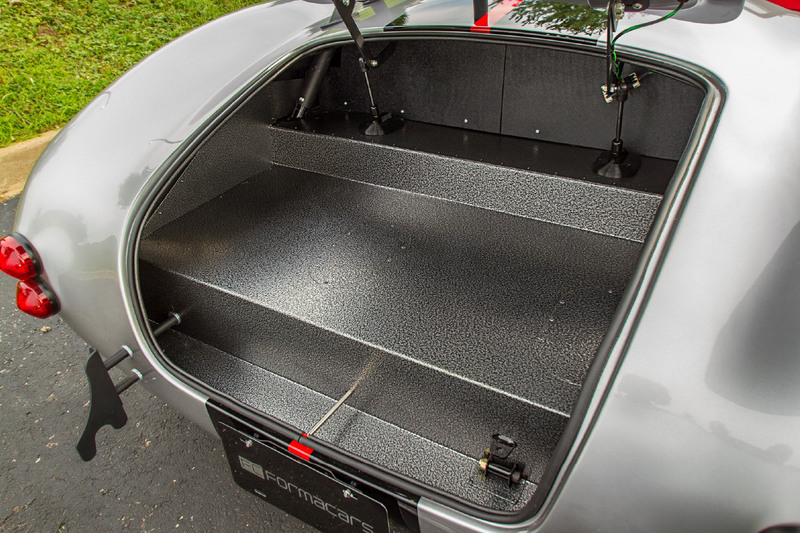 The doors, hood and trunk lid are double skinned with a smooth finish and added rigidity, with steel inserts in the hinge and lock areas for added durability and strength. Body is painted with a show quality two-stage Billet Silver Metallic primary color that features two Venom Black stripes separated by an Adrenaline Red center stripe base coat/clear coat finish. Custom billet fender badging. The front suspension features independent tubular control arms, high end KONI mono-tube adjustable coil-over rod-end, ride height adjustable shocks, 17” diameter x 9” wide Halibrand style wheels and Nitto NT555 G2 245/45ZR17 ultra high performance summer tires. The rear is an independent suspension with upper and lower tubular control arms, panhard bar, high end KONI mono-tube adjustable coil-over rod-end, ride height adjustable shocks,17” diameter x 10.5” wide Halibrand style wheels and Nitto NT555 G2 315/35ZR17 ultra high performance summer tires. The TORSEN® limited-slip rear differential is equipped with a 3:55:1 ring and pinion gear ratio. Power disc brakes with Ford SN95 Mustang GT 11” twin piston front and Ford S550 Mustang GT 13” single piston rear brakes. Push button electrically actuated parking brake. The engine is a low mileage, Ford Mustang, 435 HP and 400 lb.-ft. of torque, 5.0 L, V8 Coyote engine with a ECUMaster custom tuned engine management system, Moroso oil pan & pickup, Energy urethane motor mounts, and custom painted engine cover to match body. Transmission is a Ford MT82 G2, 6 speed manual transmission having a direct action shifter and custom transmission mount. 2 year / 24,000 mile limited powertrain warranty against manufacturing defects provided by FormaCars Limited, Columbus, OH. Warranty starts on the date winner takes possession. Custom headers and ceramic coated side pipes. LED headlights, running lights, turn signals, engine compartment and trunk lighting, wind wings, sun visors and driver side roll bar. Custom logo gauge package consisting of 160 MPH electronic GPS speedometer, 8K tachometer, water temperature, voltmeter, fuel, and oil pressure gauges. Equipped with adjustable traction control, flat foot shifting, launch control and 3 selectable drive modes; power steering, pushbutton starting, head light, high beam, hazard lights and parking brake; steering column mounted turn signals and windshield wipers. Fully upholstered, thermal/sound insulated, carpeted with padded stepped dash, lockable glove box, padded center and rear console, upholstered door panels with billet door handles, adjustable and heated seats, 4-point seat belts, leather steering wheel, turn & high beam indicators, LED foot well lighting, windshield mounted center mirror, and cup holders. Equipped with air conditioner, defroster and floor heat, wireless entry, push button start/stop and door release, security system and waterproof audio system including Clarion audio system with Bluetooth, Kenwood amplifier and Fosgate door mounted speakers. This year, we again are using BIGCOMMERCE to handle our on-line ticket sales. BIGCOMMERCE is an extremely secure site with multiple layers of security that provides the utmost safety to your credit card transaction. Due to our using the BIGCOMMERCE site, we are unable to provide ticket numbers for your tickets. Instead of receiving a ticket with a ticket number, an e-mail confirming your purchase and the number of tickets you purchased will be sent to the e-mail address you listed when you purchased the tickets. The winner is determined by the name shown on the ticket. Your name, mail address, e-mail address, phone number and number of tickets purchased is securely saved and stored. On the day that on-line ticket sales are halted, all of the on-line ticket information is sent to a printing company. The printer then prints out actual tickets for all of the on-line sales and these tickets are then added to our ticket tumbler. For legal reasons, we cannot accept PayPal for payment of raffle tickets. Verification and acceptance of your credit card is handled by the First Data Corporation, a global secure payment company. First Data has found that some browsers have had an issue and will not allow the completion of a credit card transaction. If this happens please contact us at info@ohiocobraclub.com and we will work with you to find a solution that will allow you to purchase raffle tickets. Your raffle ticket purchase information is not sent to our website store until First Data Corporation has approved and billed your credit card. The London Cobra Show website does not process or store the credit card transaction and does not keep the related credit card information. Once our website receives your purchase information from First Data, then we will send you an e-mail confirmation of your purchase. If you have not received an e-mail confirming your ticket purchases and has been formally charged on your credit card after a four-day period or if you have any questions about your ticket purchases, please contact us with the following information. Your full name, your mailing address, telephone number, date of purchase, the number of tickets purchased and most importantly the e-mail address you used when purchasing the tickets. We will then research the transaction and promptly respond to you as soon as we can. You may contact us by e-mail at info@ohiocobraclub.com, or by going to the Contact Us section of the website and sending an e-mail to our Treasurer, or by leaving a message at 614-569-0358. Before contacting us about the ticket confirmation e-mail please check your spam folder as we have had instances where our confirming e-mails have been flagged as spam. 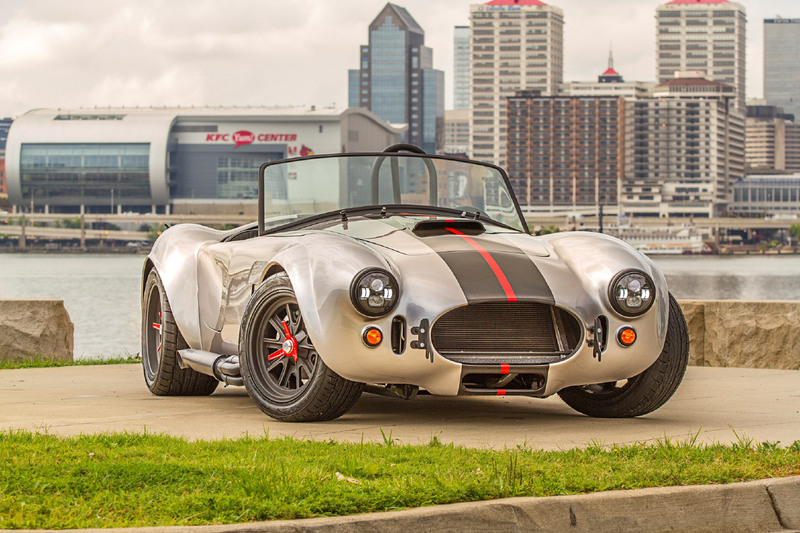 The grand prize consists of a Factory Five Racing Cobra replica, as described above. There is only one grand prize to be awarded and there is no substitution of this prize. Purchase as many raffle tickets and as often as you wish. However, you must be 18-years of age or older to purchase tickets. Only official raffle tickets will be accepted. Tickets will also be sold at car shows and other events where the car is displayed for raffle ticket sales, as a result, the Cobra will be subject to some wear and tear and will be given away “as is”. The Cobra is stored in an enclosed trailer and is only driven from the trailer into exhibition spaces and then back into the trailer. To be eligible for the drawing, tickets must be received prior to the drawing at the London Cobra Show on Saturday, June 22, 2019. No responsibility is assumed for lost, late, misdirected, damaged, illegible or postage due mail, or for printing errors. The winning ticket will be selected in a random drawing from all eligible tickets entered. The drawing will be conducted and the winner announced at approximately 9:30 pm on Saturday, June 22, 2019, at the London Cobra Show. The winner will be notified by telephone, e-mail or by USPS mail. If the winner cannot be located within 90 days, a second ticket will be drawn to determine a winner. The winner is solely responsible for all taxes, duties, shipping, licensing, registration fees and/or any miscellaneous costs related to the car and its transportation. Prior to the club transferring the Cobra's title to the winner, the winner must pay the club Federal taxes in the amount of 25% of the Cobra's fair market value. This is a requirement of the Tax-Exempt and Government Entities Division of the Internal Revenue Services - Notice 1340 (March 2005), Tax-Exempt Organizations and Raffle Prizes, Reporting Requirements and Federal Income Tax Withholding. 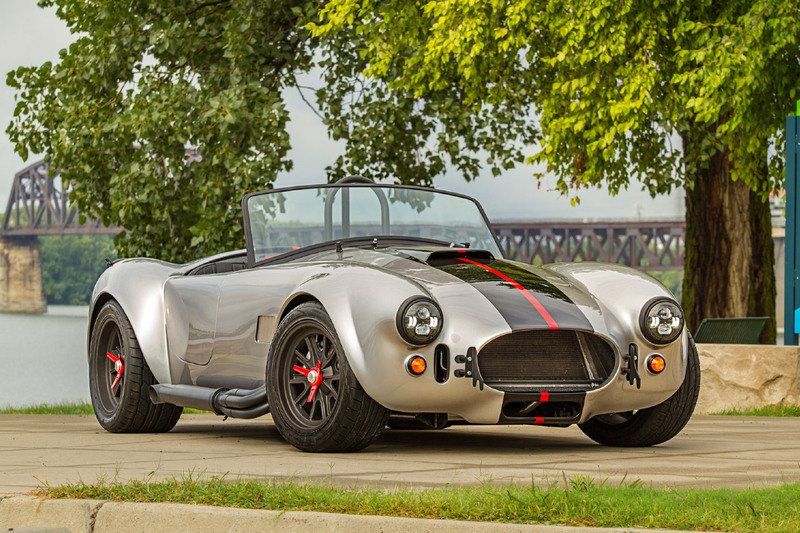 An independent automotive appraiser has set the fair market value of the London Cobra Show's 2019 raffle car at $50,000.00. The winner is responsible for shipment of the car. The winner releases the London Cobra Show/Ohio Cobra Club, Inc. and its officers, agents, and members from any responsibility or liability in connection with the loss, accident, injury or death incurred in connection with the use of this prize. The London Cobra Show/Ohio Cobra Club, Inc. does not make, nor is responsible for, a warranty or a guarantee with regards to this prize. By acceptance of this prize, winner consents to the use of his/her name and address and/or likeness for purposes of advertising or trade without additional compensation. By entering the raffle, each participant agrees to abide by the rules of the raffle. The London Cobra Show/Ohio Cobra Club, Inc. reserves the right to amend, revise, and interpret these rules as it sees fit. This raffle is subject to all applicable Federal, State and local laws and is void where prohibited or otherwise restricted by applicable law.